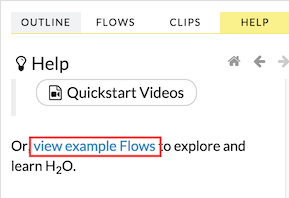 To access this documentation, select the Flow Web UI… link below the General heading in the Help sidebar. Click the Browse installed packs… link in the Packs subsection of the Help sidebar. 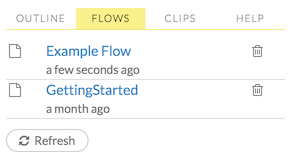 Click the examples folder and select the example flow from the list. 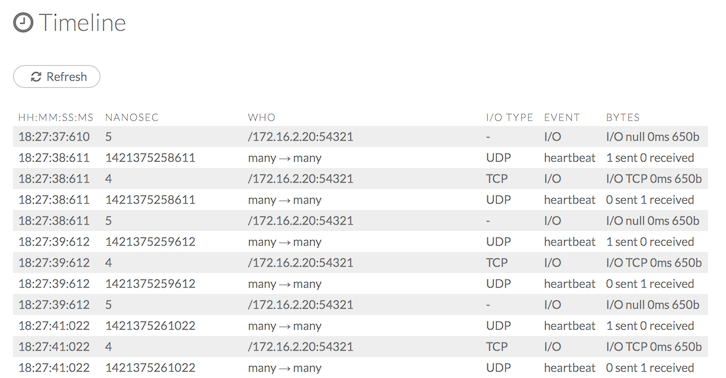 To load an exported flow, click the Flow menu and select Open Flow…. In the pop-up window that appears, click the Choose File button and select the exported flow, then click the Open button. 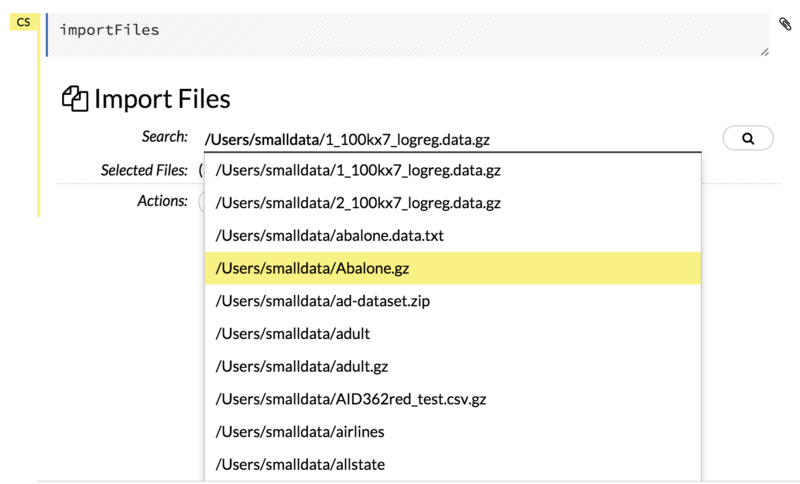 To upload a local file, click the Data menu and select Upload File…. Click the Choose File button, select the file, click the Choose button, then click the Upload button. Note: For SVMLight data, the column indices must be >= 1 and the columns must be in ascending order. For AVRO, only version 1.8.0 is supported. Note: When parsing a data file containing timestamps that do not include a timezone, the timestamps will be interpreted as UTC (GMT). You can search for a column by entering it in the Search by column name… entry field above the first column name entry field. As you type, H2O displays the columns that match the specified search terms. 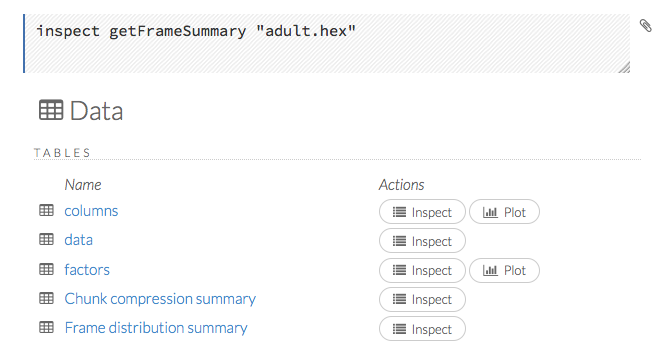 The Build Model… button can be accessed from any page containing the .hex key for the parsed data (for example, getJobs > getFrame). The following image depicts the K-Means model type. 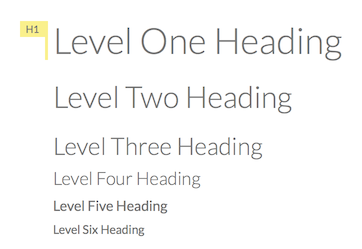 Available options vary depending on model type. Aggregator: Create an Aggregator model. CoxPH: Create a Cox Proportional Hazards model. Distributed Random Forest: Create a distributed Random Forest model. Generalized Low Rank Model: Create a Generalized Low Rank model. Stacked Ensemble: Create a Stacked Ensemble model. Word2Vec: Create a Word2Vec model. XGBoost: Create an XGBoost model. You can also specify to run AutoML, which automatically trains and tunes models while requiring as few parameters as possible. 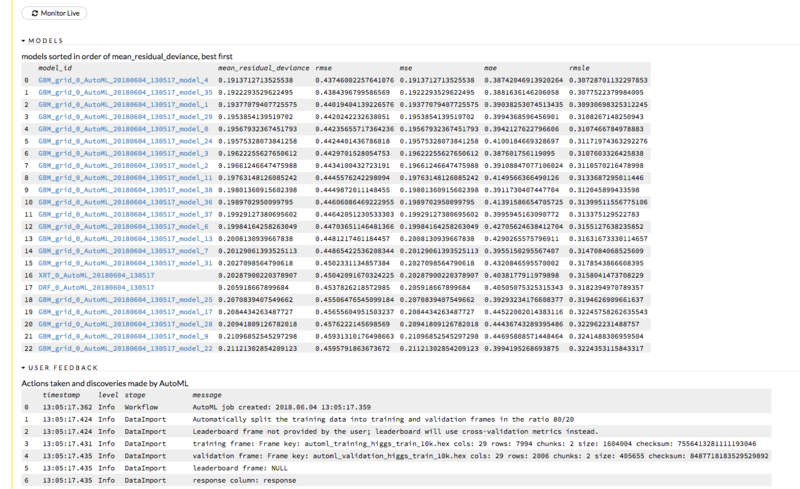 All the user needs to do is point to a dataset, identify the response column, and optionally specify a time-constraint. 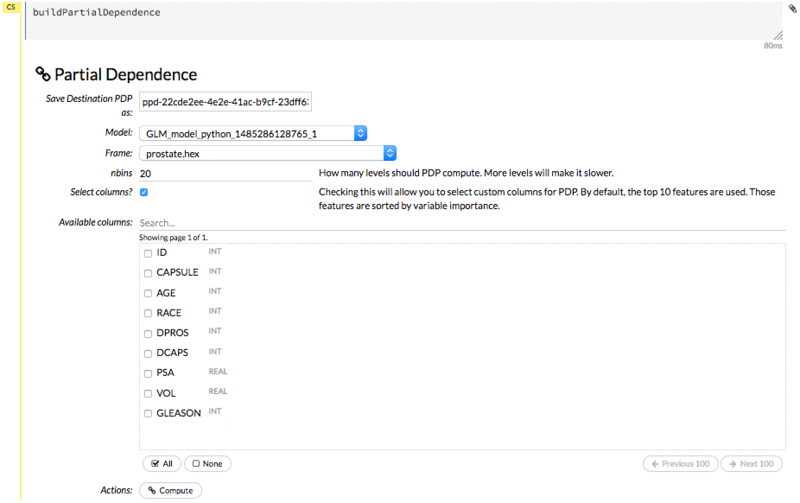 response_column: (Required for GBM, DRF, Deep Learning, GLM, Naïve-Bayes, Stacked Ensembles, AutoML, XGBoost, CoxPH) Select the column to use as the dependent variable. family: (GLM) Select the model type (Gaussian, Binomial, Multinomial, Poisson, Gamma, Tweedie, Negativebinomial, or Ordinal). link: (GLM) Select a link function (Identity, Family_Default, Logit, Log, Inverse, Tweedie, Ologit, Oprobit, or Ologlog). alpha: (GLM) Specify the regularization distribution between L2 and L2. A value of 1 for alpha represents Lasso regression, a value of 0 produces Ridge regression and anything in between specifies the amount of mixing between the two. Default value of alpha is 0 when SOLVER = ‘L-BFGS’, 0.5 otherwise. ntrees: (GBM, DRF, XGBoost) Specify the number of trees. max_depth: (GBM, DRF, XGBoost) Specify the maximum tree depth. min_rows: (GBM, DRF, XGBoost) Specify the minimum number of observations for a leaf (“nodesize” in R). learn_rate: (GBM, XGBoost) Specify the learning rate. The range is 0.0 to 1.0.
sample_rate: (GBM, DRF, XGBoost, IF) Specify the row sampling rate (x-axis). The range is 0.0 to 1.0. Higher values may improve training accuracy. Test accuracy improves when either columns or rows are sampled. For details, refer to “Stochastic Gradient Boosting” (Friedman, 1999). sample_size: (IF) The number of randomly sampled observations used to train each Isolation Forest tree. Only one of sample_size or sample_rate should be defined. If sample_rate is defined, sample_size will be ignored. This value defaults to 256.
col_sample_rate: (GBM, DRF, XGBoost) Specify the column sampling rate (y-axis). The range is 0.0 to 1.0. Higher values may improve training accuracy. Test accuracy improves when either columns or rows are sampled. For details, refer to “Stochastic Gradient Boosting” (Friedman, 1999). score_each_iteration: (K-Means, DL, DRF, Naïve Bayes, PCA, GBM, GLM, XGBoost) To score during each iteration of the model training, check this checkbox. 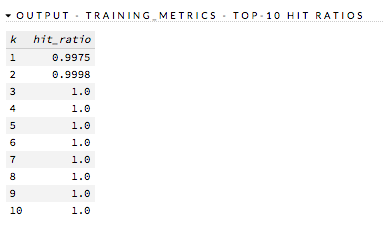 max_iterations: (K-Means, PCA, GLM, CoxPH) Specify the number of training iterations. max_models: (AutoML) This option allows the user to specify the maximum number of models to build in an AutoML run. max_runtime_secs: (XGBoost, AutoML) This option controls how long the AutoML run will execute. This value defaults to 3600 seconds. base_model: (Stacked Ensembles) Specify a list of models (or model IDs) that can be stacked together. Models must have been cross-validated (i.e. nfolds>1 or fold_column was specified), they all must use the same cross-validation folds, and keep_cross_validation_predictions must have been set to True. One way to guarantee identical folds across base models is to set fold_assignment = "Modulo" in all the base models. It is also possible to get identical folds by setting fold_assignment = "Random" when the same seed is used in all base models. metalearner_algorithm: (Stacked Ensembles) Type of algorithm to use as the metalearner. 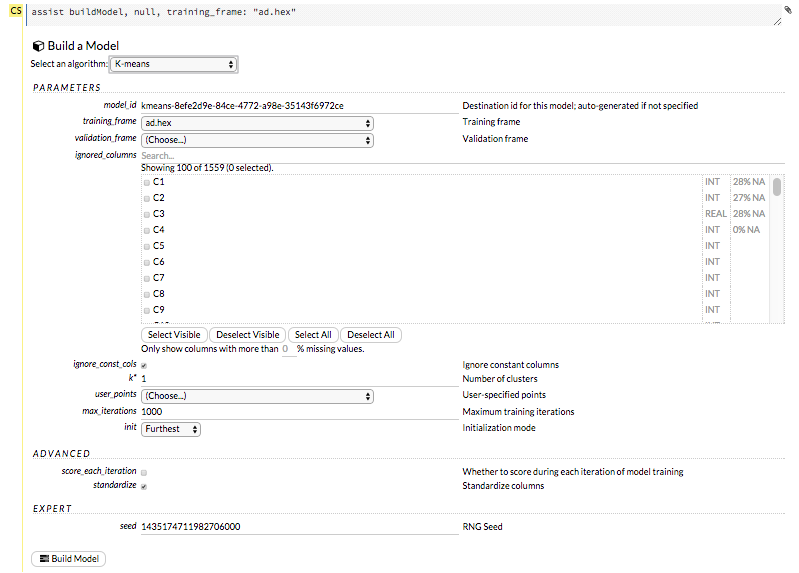 Options include ‘AUTO’ (GLM with non negative weights; if validation_frame is present, a lambda search is performed), ‘glm’ (GLM with default parameters), ‘gbm’ (GBM with default parameters), ‘drf’ (Random Forest with default parameters), or ‘deeplearning’ (Deep Learning with default parameters). metalearner_nfolds: (Stacked Ensembles) Number of folds for K-fold cross-validation of the metalearner algorithm (0 to disable or >= 2). metalearner_params: (Stacked Ensembles) A dictionary/list of parameters to be passed in along with the metalearner_algorithm. If this is not specified, then default values for the specified algorithm will be used. start_column: (CoxPH) (Optional) The name of an integer column in the source data set representing the start time. If supplied, the value of the start_column must be strictly less than the stop_column in each row. stop_column: (CoxPH) The name of an integer column in the source data set representing the stop time. fold_assignment: (GLM, GBM, DL, DRF, K-Means, XGBoost) (Applicable only if a value for nfolds is specified and fold_column is not selected.) Select the cross-validation fold assignment scheme. The available options are Random or Modulo. fold_column: (GLM, GBM, DL, DRF, K-Means, XGBoost) Select the column that contains the cross-validation fold index assignment per observation. 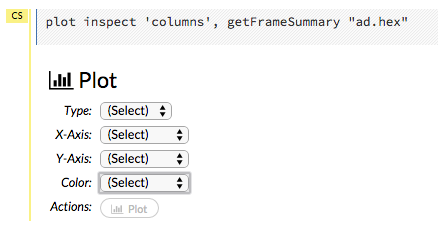 offset_column: (GLM, DRF, GBM, DL, XGBoost, CoxPH) Select a column to use as the offset. Note: Offsets are per-row “bias values” that are used during model training. For Gaussian distributions, they can be seen as simple corrections to the response (y) column. Instead of learning to predict the response (y-row), the model learns to predict the (row) offset of the response column. For other distributions, the offset corrections are applied in the linearized space before applying the inverse link function to get the actual response values. For more information, refer to the following link. 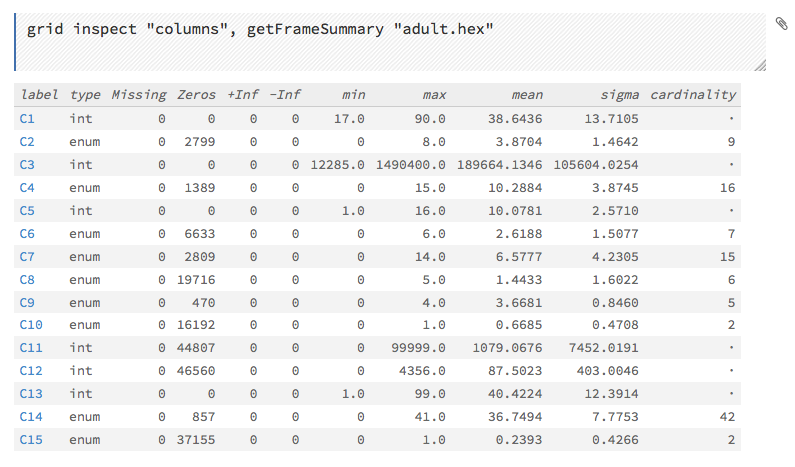 weights_column: (GLM, DL, DRF, GBM, XGBoost, CoxPH) Select a column to use for the observation weights. The specified weights_column must be included in the specified training_frame. Python only: To use a weights column when passing an H2OFrame to x instead of a list of column names, the specified training_frame must contain the specified weights_column. Note: Weights are per-row observation weights and do not increase the size of the data frame. This is typically the number of times a row is repeated, but non-integer values are supported as well. During training, rows with higher weights matter more, due to the larger loss function pre-factor. checkpoint: (DL, DRF, GBM) Enter a model key associated with a previously trained model. Use this option to build a new model as a continuation of a previously generated model. balance_classes: (GBM, DL, Naive-Bayes, AutoML) Oversample the minority classes to balance the class distribution. 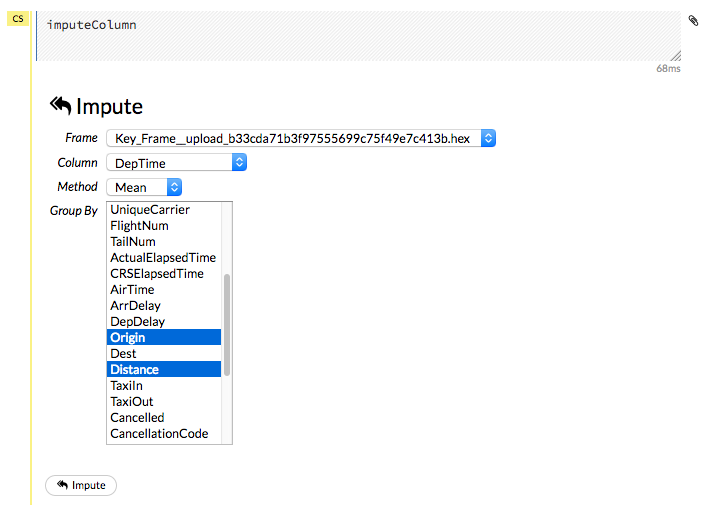 This option is not selected by default and can increase the data frame size. This option is only applicable for classification. Majority classes can be undersampled to satisfy the max_after_balance_size parameter. stopping_rounds: (GBM, DRF, DL, XGBoost, AutoML) Stops training when the option selected for stopping_metric doesn’t improve for the specified number of training rounds, based on a simple moving average. To disable this feature, specify 0. The metric is computed on the validation data (if provided); otherwise, training data is used. N+1 models may be off by the number specified for stopping_rounds from the best model, but the cross-validation metric estimates the performance of the main model for the resulting number of epochs (which may be fewer than the specified number of epochs). stopping_tolerance: (GBM, DRF, DL, XGBoost, AutoML) This option specifies the tolerance value by which a model must improve before training ceases. distribution: (GBM, DL, XGBoost) Specify the distribution (i.e., the loss function). The options are AUTO, bernoulli, multinomial, gaussian, poisson, gamma, or tweedie. AUTO distribution is performed by default. In this case, the algorithm will guess the model type based on the response column type. If the response column type is numeric, AUTO defaults to “gaussian”; if categorical, AUTO defaults to bernoulli or multinomial depending on the number of response categories. tweedie_power: (DL, GBM, XGBoost) (Only applicable if Tweedie is selected for Family) Specify the Tweedie power. The range is from 1 to 2. For a normal distribution, enter 0. For Poisson distribution, enter 1. For a gamma distribution, enter 2. For a compound Poisson-gamma distribution, enter a value greater than 1 but less than 2. For more information, refer to Tweedie distribution. 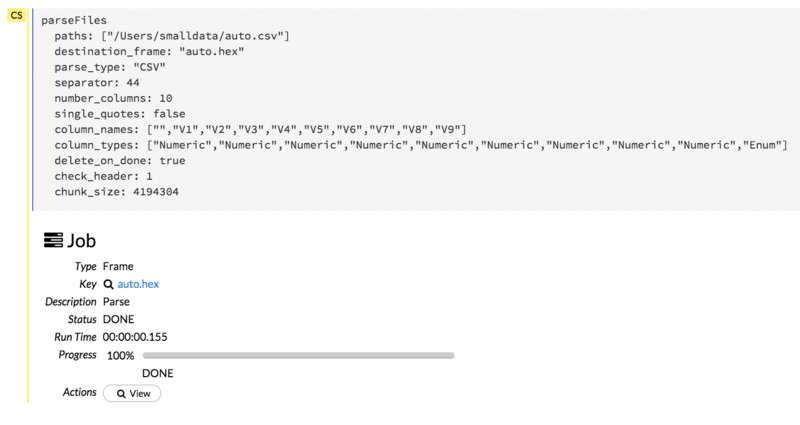 categorical_encoding: Specify one of the following encoding schemes for handling categorical features: Note that the default value varies based on the algorithm. AUTO: Allow the algorithm to decide. This is determined by the algorithm. SortByResponse: Reorders the levels by the mean response (for example, the level with lowest response -> 0, the level with second-lowest response -> 1, etc.). This is useful in GBM/DRF, for example, when you have more levels than nbins_cats, and where the top level splits now have a chance at separating the data with a split. EnumLimited: Automatically reduce categorical levels to the most prevalent ones during training and only keep the T most frequent levels. col_sample_rate_per_tree: (XGBoost) Specify the column subsampling rate per tree. monotone_constraints: (XGBoost, GBM) A mapping representing monotonic constraints. Use +1 to enforce an increasing constraint and -1 to specify a decreasing constraint. Note that constraints can only be defined for numerical columns. Also note that in GBM, this option can only be used when the distribution is either gaussian or bernoulli. 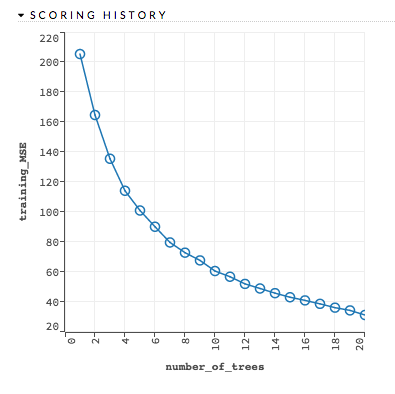 score_tree_interval: (XGBoost) Score the model after every so many trees. min_split_improvement: (XGBoost) Specify the minimum relative improvement in squared error reduction in order for a split to happen. num_leaves: (XGBoost) When the tree_method is “hist”, specify the maximum number of leaves to include each tree. auto (default): Allow the algorithm to choose the best method. 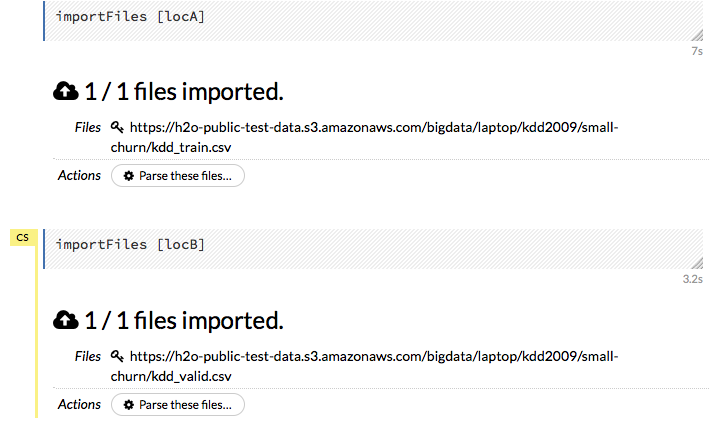 For small to medium dataset, “exact” will be used. For very large datasets, “approx” will be used. exact: Use the exact greedy method. approx: Use an approximate greedy method. hist: Use a fast histogram optimized approximate greedy method. grow_policy: (XGBoost) Specify the way that new nodes are added to the tree. “depthwise” (default) splits at nodes that are closest to the root; “lossguide” splits at nodes with the highest loss change. dmatrix_type: (XGBoost) Specify the type of DMatrix. Valid options are “auto”, “dense”, and “sparse”. Note that for a DMatrix type of “sparase”, NAs and 0 are treated equally. metalearner_fold_assignment: (Stacked Ensembles) Cross-validation fold assignment scheme for metalearner cross-validation. Defaults to AUTO (which is currently set to Random). The ‘Stratified’ option will stratify the folds based on the response variable, for classification problems. 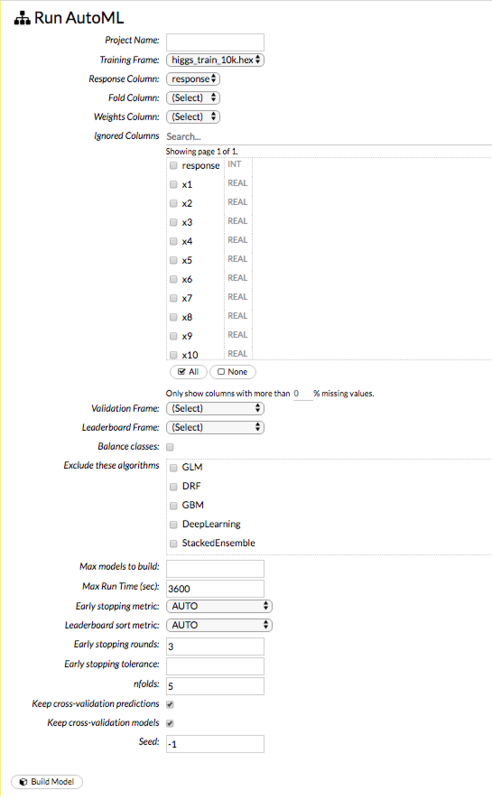 metalearner_fold_column: (Stacked Ensembles) Column with cross-validation fold index assignment per observation for cross-validation of the metalearner. 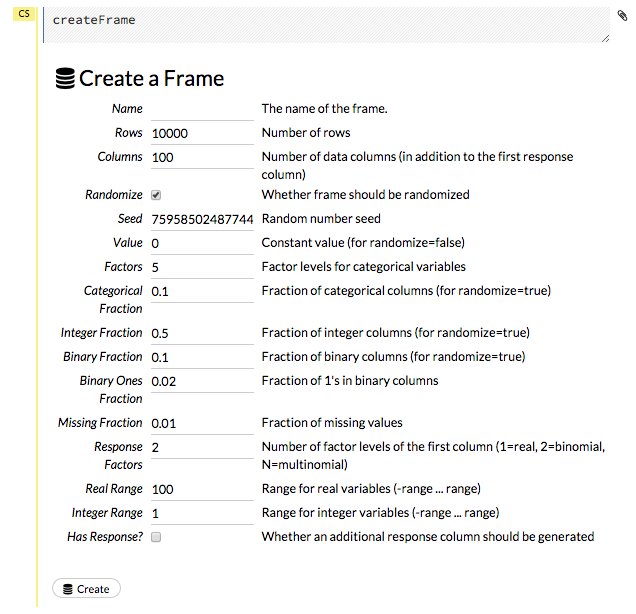 keep_levelone_frame: (Stacked Ensembles) Keep the level one data frame that’s constructed for the metalearning step. This option is disabled by default. stratify_by: (CoxPH) A list of columns to use for stratification. ties: (CoxPH) The approximation method for handling ties in the partial likelihood. This can be either efron (default) or breslow). See the Cox Proportional Hazards Model Details section below for more information about these options. 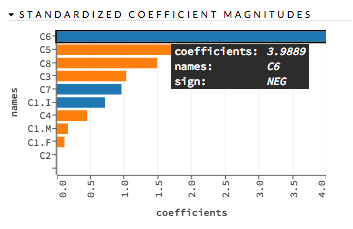 init: (CoxPH) (Optional) Initial values for the coefficients in the model. This value defaults to 0.
lre_min: (CoxPH) A positive number to use as the minimum log-relative error (LRE) of subsequent log partial likelihood calculations to determine algorithmic convergence. The role this parameter plays in the stopping criteria of the model fitting algorithm is explained in the Cox Proportional Hazards Model Algorithm section below. This value defaults to 9.
export_checkpoints_dir: (DL, DRF, GBM) Optionally specify a path to a directory where every generated model will be stored when checkpointing models. custom_metric_func: (GBM, DRF, GLM) Optionally specify a custom evaluation function. keep_cross_validation_models: (GLM, GBM, DL, DRF, K-Means, XGBoost, AutoML) Specify whether to keep the cross-validated models. Keeping cross-validation models may consume significantly more memory in the H2O cluster. This option defaults to FALSE. keep_cross_validation_predictions: (GLM, GBM, DL, DRF, K-Means, XGBoost, AutoML) To keep the cross-validation predictions, check this checkbox. In AutoML, this needs to be set to TRUE if running the same AutoML object for repeated runs because CV predictions are required to build additional Stacked Ensemble models in AutoML. This option defaults to FALSE. keep_cross_validation_fold_assignment: (GBM, DRF, DL, GLM, Naïve-Bayes, K-Means, XGBoost, AutoML) Enable this option to preserve the cross-validation fold assignment. class_sampling_factors: (DRF, GBM, DL, Naive-Bayes, AutoML) Specify the per-class (in lexicographical order) over/under-sampling ratios. By default, these ratios are automatically computed during training to obtain the class balance. This option is only applicable for classification problems and when balance_classes is enabled. 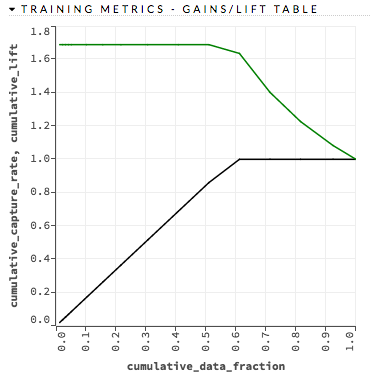 max_after_balance_size: (DRF, GBM, DL, Naive-Bayes, AutoML) Specify the maximum relative size of the training data after balancing class counts (can be less than 1.0). Defaults to 5.0. Requires balance_classes. max_abs_leafnode_pred: (GBM, XGBoost) The maximum absolute value of a leaf node prediction. max_bin: (XGBoost) For tree_method=hist only: specify the maximum number of bins for binning continuous features. booster: (XGBoost) Specify the booster type. This can be one of the following: “gbtree”, “gblinear”, or “dart”. Note that “gbtree” and “dart” use a tree-based model while “gblinear” uses linear function. This value defaults to “gbtree”. reg_lambda: (XGBoost) Specify a value for L2 regularization. reg_alpha: (XGBoost) Specify a value for L1 regularization. backend: (XGBoost) Specify the backend type. This can be done of the following: “auto”, “gpu”, or “cpu”. gpu_id: (XGBoost) If a GPU backend is available, specify Which GPU to use. “uniform” (default): Dropped trees are selected uniformly. “weighted”: Dropped trees are selected in proportion to weight. “tree” (default): New trees have the same weight as each of the dropped trees 1 / (k + learning_rate). “forest”: New trees have the same weight as the sum of the dropped trees (1 / (1 + learning_rate). rate_drop: (XGBoost) For booster=dart only: specify a float value from 0 to 1 for the rate at which to drop previous trees during dropout. one_drop: (XGBoost) For booster=dart only: specify whether to enable one drop, which causes at least one tree to always drop during the dropout. skip_drop: (XGBoost) For booster=dart only: specify a float value from 0 to 1 for the skip drop. This determines the probability of skipping the dropout procedure during a boosting iteration. If a dropout is skipped, new trees are added in the same manner as “gbtree”. Note that non-zero skip_drop has higher priority than rate_drop or one_drop. pred_noise_bandwidth: (GBM) The bandwidth (sigma) of Gaussian multiplicative noise ~N(1,sigma) for tree node predictions. 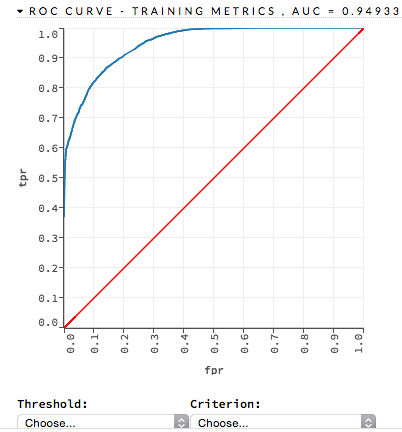 calibrate_model: (DRF, GBM) Use Platt scaling to calculate calibrated class probabilities. Defaults to False. calibration_frame: (DRF, GBM) Specifies the frame to be used for Platt scaling. interactions: (GLM, CoxPH) Specify a list of predictor column indices to interact. All pairwise combinations will be computed for this list. interaction_pairs: (GLM, CoxPH) When defining interactions, use this to specify a list of pairwise column interactions (interactions between two variables). Note that this is different than interactions, which will compute all pairwise combinations of specified columns. check_constant_response: (GBM, DRF) Check if the response column is a constant value. If enabled (default), then an exception is thrown if the response column is a constant value. If disabled, then the model will train regardless of the response column being a constant value or not. Click on a model name to view details about the model. The information that displays varies based on the algorithm that was used to build the model, but it can include the parameters used when building the model, scoring history, training metrics, coefficient tables, and a POJO preview. Predict: Use this model to make predictions. Download POJO: Generates a Plain Old Java Object (POJO) that can use the model outside of H2O. 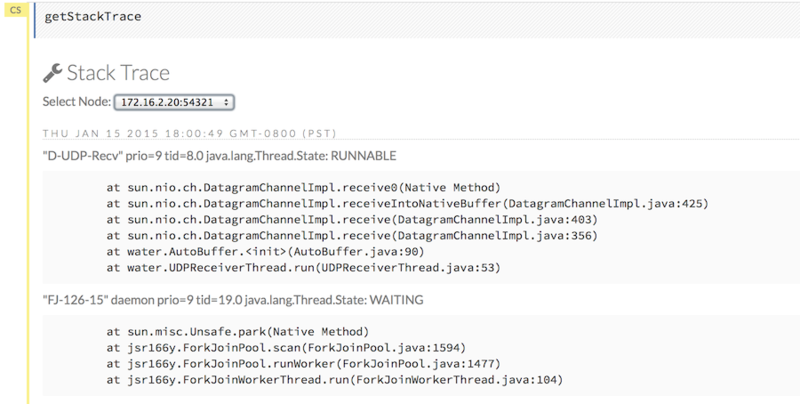 Note that a POJO can be run in standalone mode or it can be integrated into a platform, such as Hadoop’s Storm. To make the POJO work in your Java application, you will also need the h2o-genmodel.jar file (available via the Download Generated Model button, from the Admin menu, or in h2o-3/h2o-genmodel/build/libs/h2o-genmodel.jar). Note that POJOs are are not supported for XGBoost models. Download Model Deployment Package (MOJO): Downloads a zip file containing the Model ObJect, Optimized (MOJO). 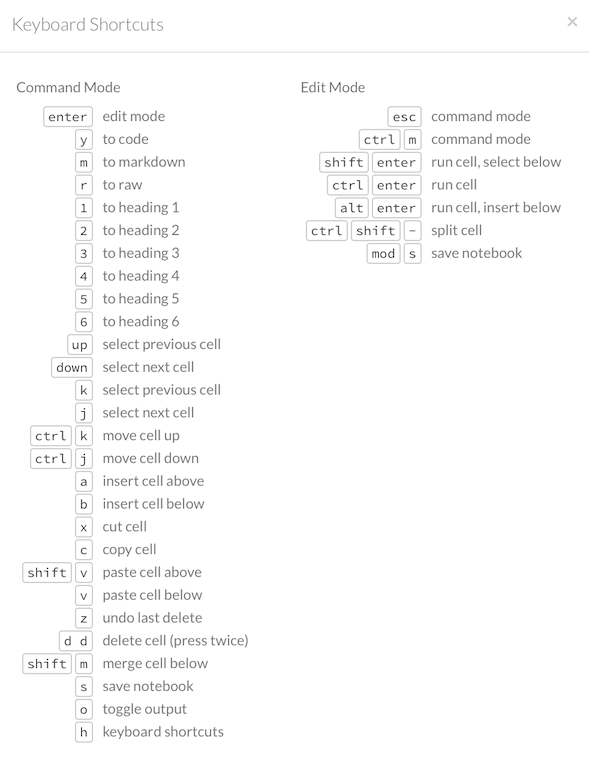 This file includes the outputting model information in JSON format. Note that MOJOs are available for AutoML, Deep Learning, DRF, GBM, GLM, GLRM, K-Means, Stacked Ensembles, SVM, Word2vec, and XGBoost models. 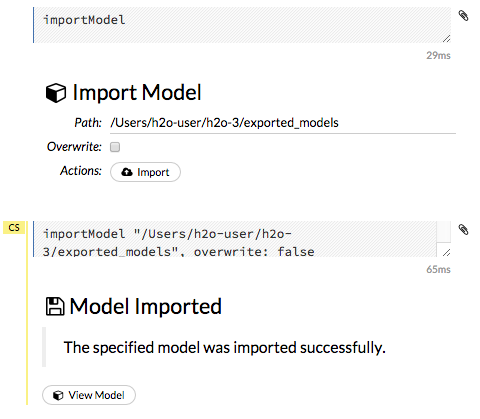 Export: Exports a built model. Inspect: Inspect the model. Clicking this button displays a data table of the model parameters and output information. Download Gen Model: Downloads the Generated Model (h2o-genmodel.jar) file for this model. Note that this is also available from the Admin dropdown menu. 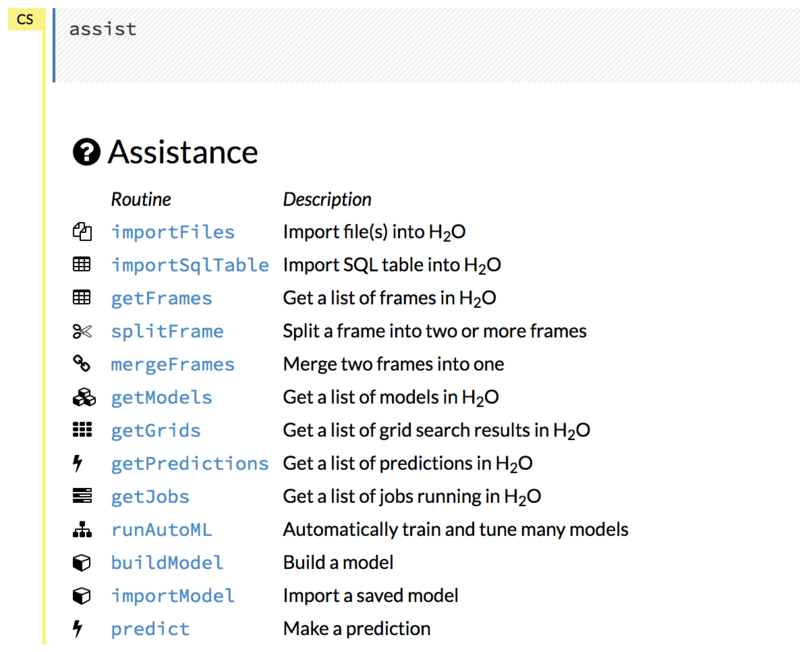 AutoML automatically trains and tunes models while requiring as few parameters as possible. A user is only required to point to a dataset, identify the response column and optionally specify a time constraint, a maximum number of models constraint, and early stopping parameters. AutoML will then begin training models and will stop as specified in the configuration (i.e., when the maximum number of models has been reached, when the maximum run time has been reached, or when the stopping criteria are met). Stacked Ensembles will also be automatically trained on the collection of individual models to produce a highly predictive ensemble model which, in most cases, will be the top performing model in the AutoML leaderboard. Note that Stacked Ensembles are not yet available for multiclass classification problems, so in that case, only singleton models will be trained. The outputted models will display on a leaderboard, showing the best results first. The Leaderboard Frame can be specified when configuring the AutoML run. The frame will not be used for anything besides creating the leaderboard. If a Leaderboard Frame is not specified, then one will be created from the Training Frame. 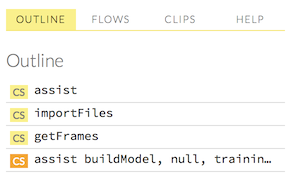 To begin an AutoML run, select Models > Run AutoML from the top menu. At a minimum, specify the training frame and the response column. (Note that by default, the AutoML run will end after 3600 seconds.) Click Build Model to start the run. Click the View button to view the Leaderboard and/or monitor the current AutoML run. After clicking View, the Leaderboard displays the list of models that were built in the order of mean_residual_deviance (best model first). While AutoML is running, click the Monitor Live button and scroll down to view a live feed of the User Feedback progress of AutoML. 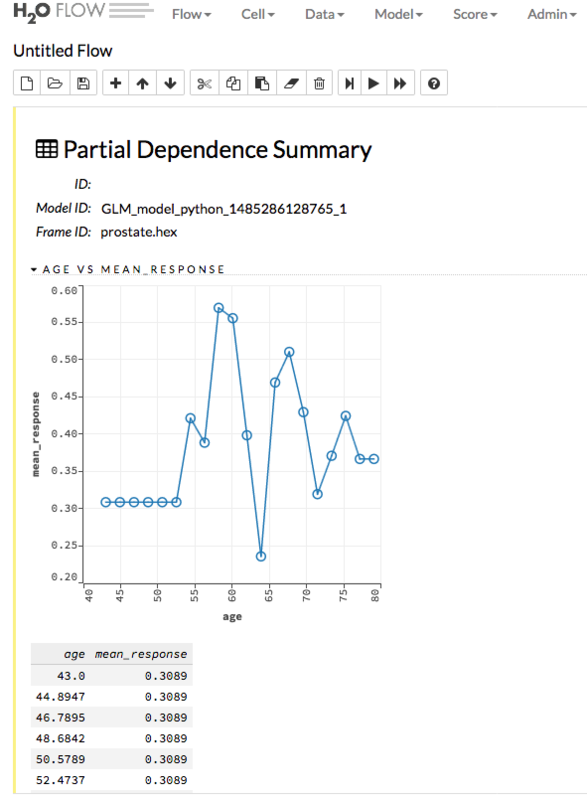 This section provides details about each step taken by AutoML, including the parameters being configured, the dataset’s features, and model training information. 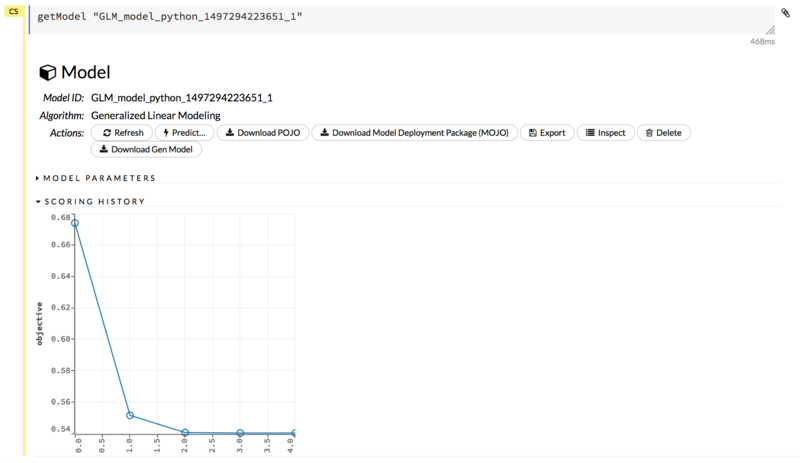 Note: You can also monitor or view an AutoML run if the run was started through Python or R. In this case, open Flow, click Admin > Jobs from the top menu, then click the AutoML hyperlink. Variable importances: (GBM, DRF, DL) Represents the statistical significance of each variable in the data in terms of its affect on the model. 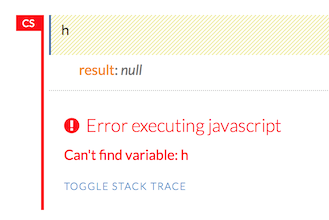 Variables are listed in order of most to least importance. 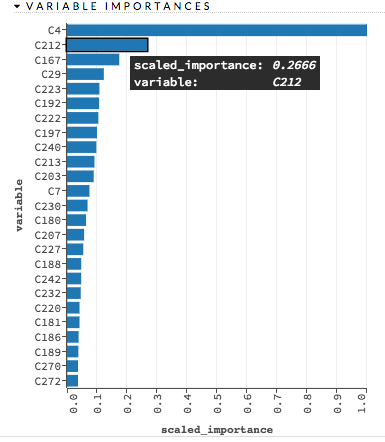 The percentage values represent the percentage of importance across all variables, scaled to 100%. The method of computing each variable’s importance depends on the algorithm. To view the scaled importance value of a variable, use your mouse to hover over the bar representing the variable. Refer to the Variable Importance section for more information. Confusion Matrix: (RF, GBM) Table depicting performance of algorithm in terms of false positives, false negatives, true positives, and true negatives. 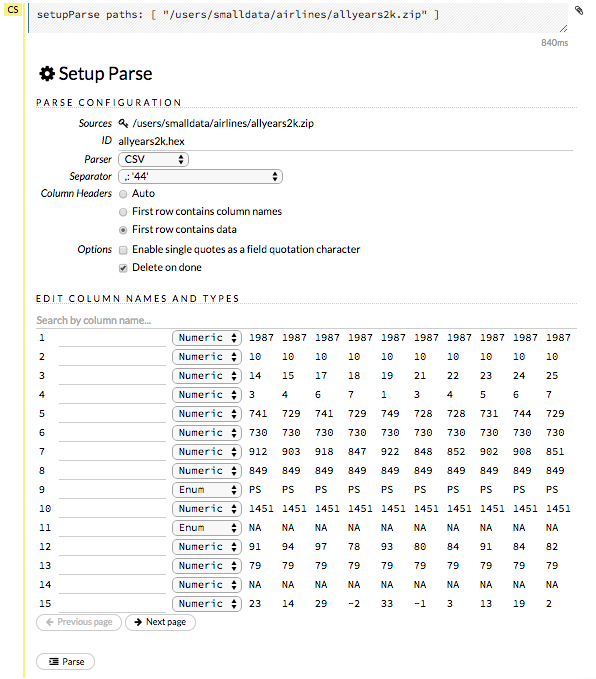 The actual results display in the columns and the predictions display in the rows; correct predictions are highlighted in yellow. In the example below, 0 was predicted correctly 902 times, while 8 was predicted correctly 822 times and 0 was predicted as 4 once. To compute Gains/Lift, H2O applies the model to the original dataset to find the response probability. The data is divided into groups by quantile thresholds of the response probability. Note that the default number of groups is 16; if there are fewer than 16 unique probability values, then the number of groups is reduced to the number of unique quantile thresholds. For binning, H2O uses the following probabilities vector to create cut points (0.99, 0.98, 0.97, 0.96, 0.95, 0.9, 0.85, 0.8, 0.7, 0.6, 0.5, 0.4, 0.3, 0.2, 0.1, 0). 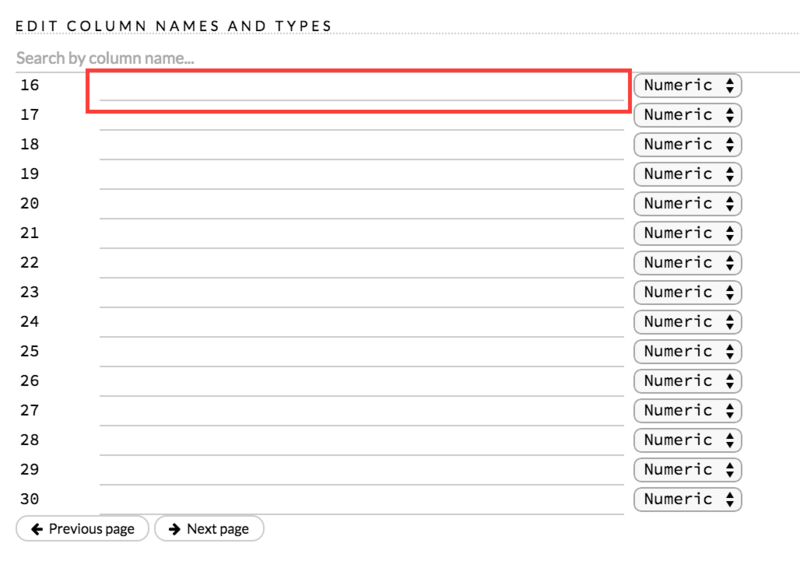 Note: You can also click the drop-down Data menu and select Split Frame…. Whether new nodes can join (locked/unlocked) Note: After you submit a job to H2O, the cluster does not accept new nodes.